Calcium is vital for healthy bones and teeth and proper growth in children. Adequate calcium intake reduces the risk for osteoporosis later in life, and more calcium is absorbed and stored in childhood than at any other time. The best sources of calcium are dairy products like milk, cheese and yogurt. If you are lactose intolerant or have a milk protein allergy, you can still get enough calcium by eating foods like canned salmon and sardines (with bones), collard greens, and the many calcium-fortified foods available, such as fortified orange juice and soy-milk! Read the nutrition facts label on all foods to see if they are rich in calcium (at least 10% DV). How much do you need? 3-A-Day, that’s 3 servings of milk, cheese or yogurt! Vitamin D has several essential bodily functions. Not only does vitamin D maintain blood calcium and phosphorus levels, it aids in the absorption of calcium to form and maintain strong bones, it works with calcium to increase bone density and decreases fractures. Recent studies show that vitamin D also may protect from osteoporosis, hypertension, cancer and several autoimmune diseases! Heat a griddle or large frying pan over medium-high heat. Rotate it regularly to make sure it’s evenly heated. Once it’s hot, turn down the heat to medium and maintain a hot surface. While the griddle or pan heats up, make the batter: In a medium bowl, whisk together yogurt and eggs. Stir in the oil. Add in flour, sugar, baking powder, baking soda, and salt. Whisk to incorporate ingredients. Do not over mix. Brush or spray oil onto the hot griddle or pan and spoon the batter into even cakes – about 8 – and let cook until bubbles form on the surface of the cakes, about 2 minutes. Flip. Cooking another 2 minutes. 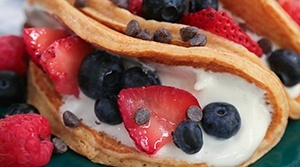 Serve with Organic Greek yogurt filling, and additional toppings of choice like chocolate chips, coconut, chia seeds, flax seeds, strawberries, or blueberries. Chef’s Note: You want a drop of water to bounce or dance off your griddle to ensure crisp and evenly cooked pancakes. If the water splatters or explodes, that is too hot.